Well, having mentioned Rafa in the last post, only a couple of days back, it’s worth bringing everyone’s attention to his astonishing victory on Sunday in the Masters 1000 event in Indian Wells. Whatever you might think of Rafa, no other player in the current era could have achieved this. 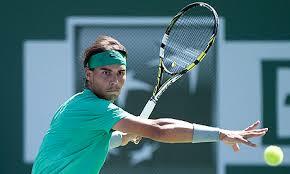 Rafa had not played competitively from his second round loss at Wimbledon last year until last month. He eased himself in with tournaments on his favoured clay in South America. However, here he was back on hard courts, with all the top players present. He beat Federer in the quarters and Berdych in the semis. Meanwhile in the other half of the draw Del Potro removed both Murray and Djokovic in phenomenal displays of aggressive hitting, particularly on the forehand side. In the final, despite an early lapse, Del Potro hit his stride and took control, winning the first set and going a break up. But as I mentioned in the last post, the very best do not panic and by sheer strength of will (plus some very good tennis) Nadal pulled himself back into the match and went on to win in three sets. For most players, however good, getting back into their stride after a long lay-off takes time. Nadal’s mental strength and preparation meant he came back strong, getting to the final of his first tournament and subsequently winning tournaments on clay and now on hard courts.